GREATER TUNA - ACMA THEATRE CO.
“Greater Tuna” began as a simple party skit based on a political cartoon more than 25 years ago in Austin, Texas. Talented creators and authors Joe Sears, Jaston Williams and Ed Howard parlayed the sketch into a critically acclaimed production which has entertained audiences across the world ever since, on and off Broadway, at the White House, on Late Night with David Lettermanand as an HBO special produced by Norman Lear. Originally, this play was a two-man show, with each actor playing at least 10 different characters. In ACMA Theatre Company’s production each student actor will play multiple roles and personalities as well, stretching their imaginations and talent in new ways - invariably leading to many awkward and hilarious situations. 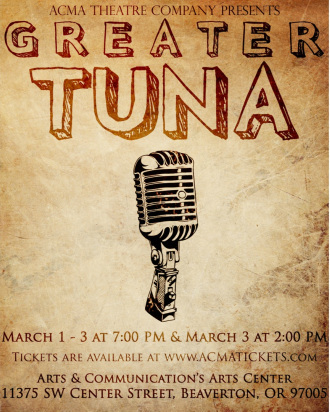 “Greater Tuna” offers comedic relief and entertainment for the whole family. for grades 6 through 12 in the Beaverton School District. Learn more about us at the ACMA Website.